$144.99 to $149.99 & FREE Shipping on orders over $59 $35. Add a Recirculation Infusion Mash System heater to your home brewing system by adding the RIMS-Rocket™ Electric Immersion heating coil. This low-density 3500 W (2000 W), 240V (120V), ultra low watt density heating system is designed especially to fit into the HopRocket™ canister, then you simply plug it into your brewing system to gain reliable heat for the duration of your mashing process. The RIMS-Rocket™ features a "plug and play" 12 foot factory wired cable with a molded twist-lock L6-30P plug on one end and the custom removable plug on the other end, so you won’t have to worry about having a dangling power cord tethered to your heater. It also uses less than the usual ultra low watt density, so there is absolutely no chance of scorching your carefully crafted brew. 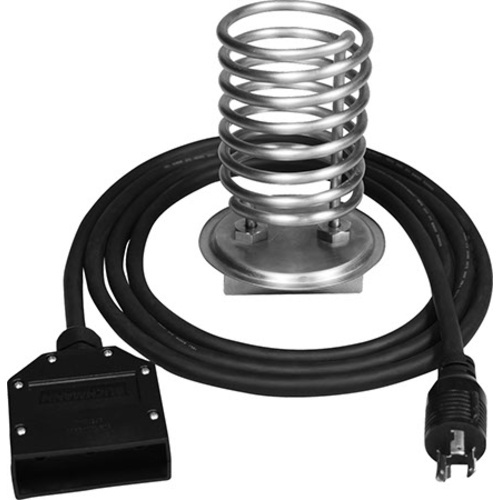 It’s incredibly easy to clean and even easier to install, making the RIMS-Rocket™ Electric Immersion heating coil one of the simplest and most affordable heaters for your homebrew setup. Please Note: This is the Electric Element for the Hop Rocket, and does not include the Hop Rocket body itself. Looks like an easy way to add RIMS capabilities to my system. I already own the hop rocket so this was a no brainer. I have a Hop Rocket and want to setup a RIMS system to do step mashing.